West End Cottage is an outstanding detached period house with much of the original oak frame displayed internally complimented by contemporary finishes and fittings providing all the benefits of 21st century living standards.The house was extended and comprehensively modernised some six years ago with the extension incorporating old oak timbers creating a character atmosphere throughout the house whilst incorporating a substantial basement which adds versatile additional living space with could be adapted to suit individual family requirements.Externally there is a self-contained annexe with bedroom/office and en suite shower room approached by an external staircase above the triple barn garage/gym. EPC rating of F.
The garden and grounds create an outstanding setting for West End Cottage with an extensive front garden laid principally to lawn bounded by mature trees and hedging with a large feature pond with substantial decking partly over sailing the water creating a tranquil sitting area.Aquatic planting creates an attractive visual display whilst also creating a natural wildlife habitat.To the rear of the house is a substantial flagstone terrace bordered by sleepers with iron archway and raised flower/shrub beds. 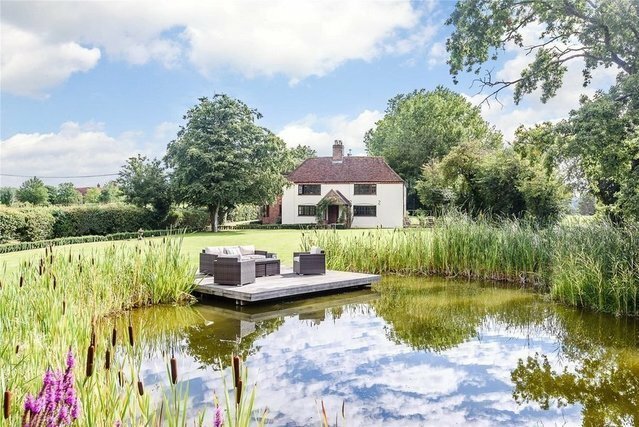 There is a further wooden decked sitting area to the side of the house and further lawned area.Overall the garden and grounds extend to approximately 1.3 acres.